Dubai is the perfect place to host events. A business and entertainment hub, Dubai is a city that is growing rapidly, and the lifestyles of those who live and work in the city can move just as fast. When it is time for a corporate event, important meeting, or even private celebration, then a hotel meeting room or other hotel venue could be exactly what you need to make a lasting impression. Why Hotel Venues for Business? Business is largely driven by results, with the remainder being made up by image and appearance. Before a client has even signed with you, they have probably judged you on your corporate image. When you are hosting clients and partners for meetings or presentations, then making a better impression than your competition can help to make sure that you retain existing lines of business, and bring new ones on board. Hotel meeting rooms are perfect for hosting seminars, meetings, and larger corporate events. With all of the amenities of a hotel on hand, attendees will be well catered to and comfortable in their surroundings. Entertainment, dining, and accommodation are all on hand, which can be crucial when you’re entertaining valuable clients and prospects. 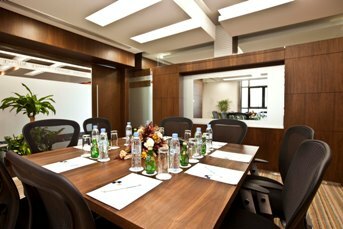 You don’t have to be throwing a large event to make use of hotel meeting rooms in Dubai. Smaller facilities are available, with all of the latest technology needs, such as high speed internet and video conferencing systems. Larger halls are also available, for trade shows, interactive training seminars, ceremonies, or even banquets. Renting a hotel venue can also be perfect for private parties and events. 21st birthday celebrations, weddings, anniversaries, graduation parties, or any event where you want a glitzy location with all of the convenience that a hotel offers, can be improved when you choose a venue from Fluidmeet. Dubai is home to some of the best hotels in the UAE. Make use of world class facilities by hiring a hotel meeting room or other venue for your next business function or private event. Fluidmeet will connect you with the leading hotels and facilities in Dubai, for a meeting or event that achieves your goals, and surpasses all of your expectations.